“How do you cook your tofu?” my youngest brother asks as he pulls a container of it from his fridge. Last time I was “home” in NYC was about 8 months ago. Immediately after I arrived at JFK airport, we drove to his house and I ended up in his kitchen helping to prepare lunch for his wife and two young sons. I quickly agreed and coincidentally had some cilantro and two ripe avocados ready to be converted into a bowl of guacamole in my red kitchen. I told him that he would have to help and be my sous chef, which he always willingly agrees to. On the eve of my departure, we took a trip to the local Tesco supermarket and shopped for the missing ingredients to complete our taco night. Earlier that afternoon, I told a friend that I would be making tacos for dinner. Knowing that I am not a big meat-eater, she asked if I would be making fish tacos and what exactly did I put in my tacos. I paused for a second then said “Actually, this would be the first time I have ever made them. I enjoyed them in Mexico, but I usually just make quesadillas.” As it turns out, “Taco Night” in Prague can be quite an expensive dinner at home. The meat is the cheapest thing on the menu, but the taco shells are a luxury item. We are talking about 5 US dollars here for a box of 6 shells. Insane! What one does for the love of family. As soon as we returned to my flat, my brother quickly got into sous chef mode. His job this evening was to prep the ingredients for the guacamole. He grabbed a chopping board, selected a knife and began taking care of the vegetables. As he was busily engaged in his task, I started working on seasoning the meat. However, I kept being interrupted with a slew of questions, as he repeatedly kept asking how exactly did I make the guacamole. He wanted to remember how to do it on his own. How sweet! It was strangely interesting to find myself immediately the next day, going over recipes in N.Y. in my “baby” brother’s kitchen. Although I am the eldest, I am the only girl between us three and we happen to be very close in age. As children, my brothers got the majority vote and I usually ended up having to go along with their play. I can remember days of shutting down the lights at home and shooting our laser tag guns at one another, having to go along with their G.I. Joe adventures and accepting that there would be no doll playing but night-time ninja action. Occasionally, I would assert my big sister position and I would get a chance to dress them up as girls and put ribbons in their hair (something they probably wish I wasn’t writing about), but these were rare moments and probably done with a bribe of some sort. Years later, here we were as adults and they were both playing my favorite game: cooking. Both brothers completely volunteering to be participants and curiously wanting to know how to entice others through food. Still somewhat jet lagged, yet excited by my brother asking how I cook tofu, I went through a quick demonstration of the way I cook it, which is slightly different from our mother’s style. Funnily enough, my batch didn’t come out as well as it normally does when I cook it at “home.” Maybe it was jet lag? A different kitchen? Who knows? The best part of this sibling moment was watching my youngest brother, take out another block of tofu and cook up a new batch. I must have taught him well as his attempt turned out to be much more appealing and tastier than mine. Scoop out the avocado (save the seed if you aren’t planning to immediately serve the guacamole, it helps maintain the vibrant green color) and mash it till it gets very soft. 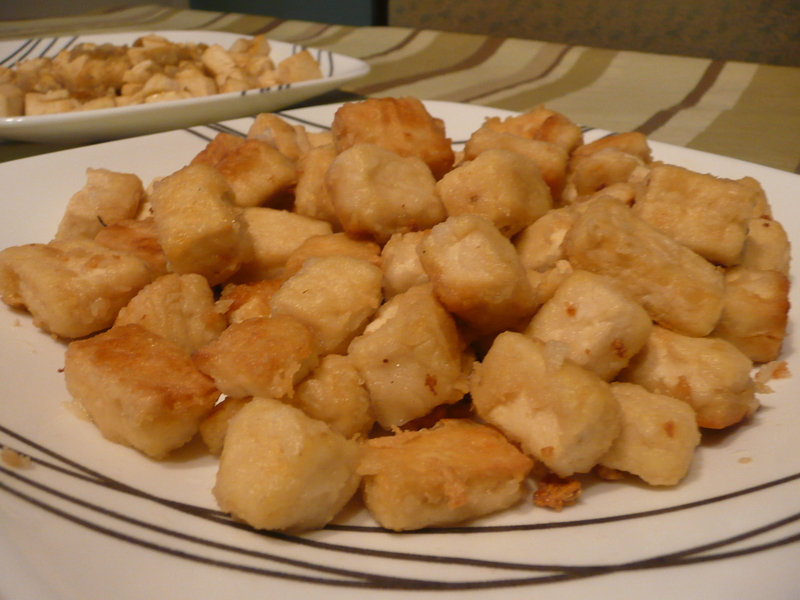 Chop tofu into small squares. Place cornstarch and salt and tofu pieces in the bag. Then give it a good shake and be sure to coat the tofu well with the cornstarch. Fry the pieces in 1-2 tablespoons of oil. Make sure the heat is high, once it is sizzling bring the heat down. Fry until golden on all sides and serve immediately. We enjoy eating this with a side of warm jasmine rice, steamed green vegetables and dipping the tofu into a mix of soy and vinegar. This winter’s snowfall has been both heavy and impressive. 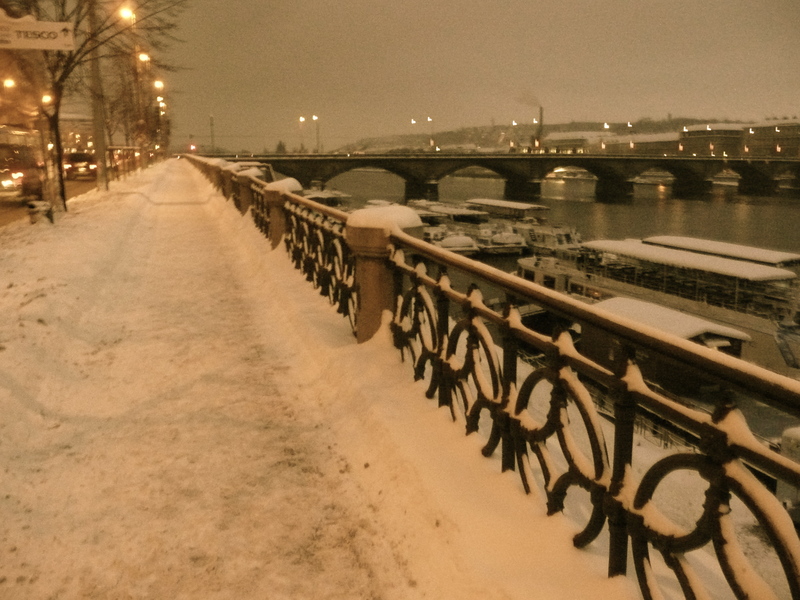 From what the locals say, Prague hasn’t received this much snow in more than 20 years. As a result, the ski season in the Czech Republic has been fantastic! So one early Saturday morning, we coaxed our drowsy bodies out of our cozy warm bed, covered them in thermals and piled on more insulated gear to protect us from the fierce cold weather. Then, along with six other friends, loaded up two cars and headed out for the Jested ski resort, just an hour and half’s drive out of Prague. We were a happy group of 8, 7 skiers and one snowboarder in tow. My ski “career” began just a mere five seasons ago and I have grown to love it. At first I considered skiing to be a painful experience and I couldn’t understand the thrill of being in the freezing cold, carrying such heavy equipment and permitting one’s precious feet to such torture by donning ski boots. I used to say that somehow this was an agreement invisibly placed somewhere in my marriage contract: I had to learn to enjoy skiing and my husband’s part was to learn how to cook. Overhearing our conversation, my husband quickly jumped in and referred to a cooking class we took during a recent trip to Luang Prabang, Laos. “It was 12 hours long!” he exclaims. “Yes, but it was tough, we had to cook and eat so much… appetizers, lunch..all day,” bemoaning and shaking his head. “Yes, but now you know how to cook a few more dishes,” I raise my brows, glance towards my friend and whisper the magic number to him…5. 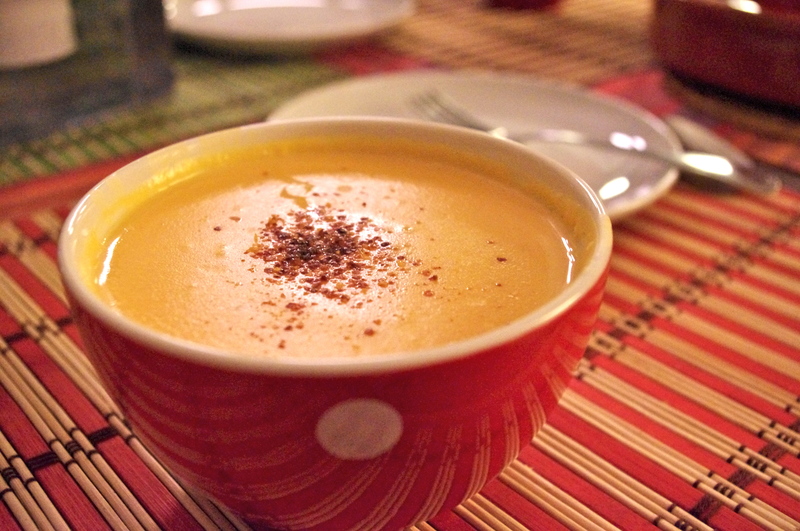 “Yes, it is a bit, but it also has some lemongrass and ginger and some chili flakes to give it some…” I say with my fist clenched tightly, shaking it in the air. My friend senses the flavors and he starts to ask me about the ingredients. In a flash, both the steps and ingredients start to roll off my tongue. 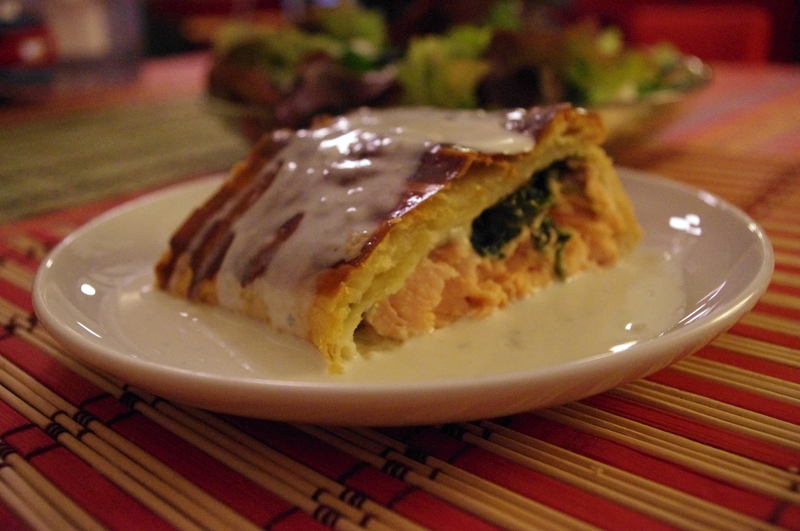 “Well, since we are on the subject of recipes, here’s a good one,” and he begins to tell me about this deliciously rich and creamy salmon Gorgonzola pastry roll. “When I serve it to people, they just think ‘Wow!’ but it is so simple to make.” he nods reassuringly. I go over the ingredients and steps one more time and log it into my memory. Coincidentally, the waiting time to get on to the ski lift and ride up to the mountain top had not felt excruciatingly long . While we were exchanging recipes, we managed to forget the pain inflicted by our ski boots, the cold chill in the air bothered us less and our senses were suddenly awakened. Isn’t it amazing how far the thought of food and cooking can take a person elsewhere? When soft, drain. Skip these first two steps if using fresh noodles. Heat 2 Tablespoons of Oil in a non-stick frying pan in medium heat. When ready, slip the noodles into the pan and let cook for about 2 minutes. Then crack the egg over the noodles. It should look like you are cooking fried eggs sunny side up. Using a flat slotted spoon, remove the fried noodles when the egg looks done. Transfer it to a plate, if you are concerned about the oil, lay the noodles on a paper towel to soak up the extra oil. When slightly cooled, cut noodles into smaller square portions. You can use the noodles for most asian stir fry noodle dishes. If you want more specific sauce recipes on this, send me a note. Using a large pot, bring flame to medium. Add onion, then pumpkin and ginger (lemongrass too). Give them a minute or two in between adding the ingredients. Add the broth. It should cover the ingredients. Add more if needed. Let it come to a boil, then bring it down to a simmer and simmer for 20-25 minutes. If you have a hand blender, you can do this directly in the pot, otherwise pour ingredients into a blender and purée. Please wait until it is somewhat cool to handle before doing this. If using lemongrass, remove the stalks before pureeing. Add purée back to the pot and stir in the coconut milk, lime juice and zest. Flavor to taste. Warm up if needed and enjoy! Heat oil. When hot, add garlic and stir. When lightly brown, add spinach, salt and pepper to taste. Stir fry for a few seconds more, remove and place it to the side. Pan sear salmon (sprinkle salt on top) for a few minutes in the same pan. Line salmon pieces in the center of the dough. Add garlic spinach mixture on top. Using about 50 grams, break pieces of the gorgonzola off and place it over the rest of the ingredients. Fold pastry dough, one edge over the other. Brush with egg yolk and bake in oven at 180/325 degrees for 20-25 minutes. Combine the leftover gorgonzola with the cream in a pan. Heat and stir (blend with hand blender for more smoothness if you like) until it turns into a sauce. When pastry is finished, add crème on top and serve!